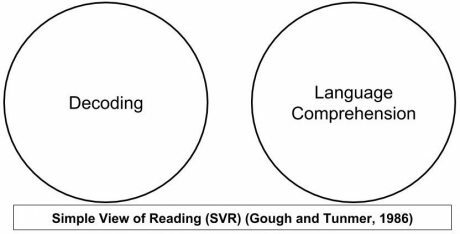 The Simple View of Reading (SVR) was proposed by researchers Gough and Tunmer in 1986. It was developed to reconcile “The Reading Wars” argument of the 1980s, between advocates of bottom up processing (decoding) and those who supported top down processing (language comprehension.) The Simple View of Reading shows us that, while reading is a complex activity, it can be represented as two interdependent processes: Word recognition (decoding) and language comprehension. Skilled reading is actually a combination of both processes. 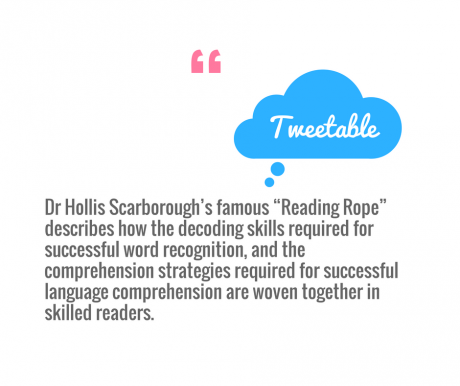 A quick search of the Internet for Dr Hollis Scarborough’s famous “Reading Rope” will give you a very nice visual representation of the decoding skills required for successful word recognition, and the comprehension strategies required for successful language comprehension. The strands are woven together in skilled readers. Word recognition is the ability to read and understand the words on a page, and language comprehension is the ability to make sense of the language we hear and the language we read. Considering the two processes in the SVR, there are in fact four possible outcomes, or reading profiles, and for each of these profiles, individual students’ difficulties may range from mild to severe. 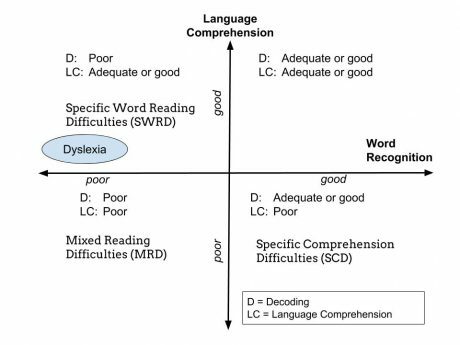 In the first installment of this blog, I am going to focus on where the SVR suggests that most dyslexic children fall; in the upper left quadrant on the diagram. So I’ll be dealing with the Specific Word Reading Difficulties (SWRD) profile. This model illustrates that the processes of developing decoding and language skills can be considered independent of each other, and that there is a continuous spectrum in terms of how easy or how hard children find each one. If either one of these components is weak, reading comprehension as a whole will be impacted. I’ll start by describing the SWRD profile, often associated with the dyslexic student. Students with this profile will have below average phonemic awareness and decoding skills. Their oral vocabulary and listening comprehension will be at least average while their fluency and reading comprehension could be below average due to those decoding problems. However, they will often learn well orally, when someone reads aloud to them, or when topics are discussed. When they are able to decode text themselves, reading comprehension will be strong. Now that I have outlined this profile, how do we help this particular kind of student? They need explicit and systematic phonics intervention. The Orton-Gillingham Online Academy provide their Level 1 Basic Language Course to meet these needs. Alongside of this, it is important to use a phoneme-level or phonemic awareness approach, that will teach letter sounds, along with blending, segmenting, and manipulation of those sounds. For a more detailed introduction to phonemic awareness, Lynn Givens has produced a webinar, which is available through the Academy. An excellent resource for teaching phonemic awareness and fluent word recognition skills, to both younger and older students, is the program Equipped for Reading Success by David A. Kilpatrick. Professor Maryanne Wolf pinpoints phoneme awareness as the #1 deficiency in the dyslexic brain. She tells us that many dyslexic children have issues with identifying phonemes as well as knowing which sounds are assigned to which letters. She also tells us that fluency, or getting the reading circuits to work together quickly, is the second biggest issue for dyslexic students. She describes in her book, Proust and the Squid, how some dyslexic children can have perfectly represented phonemes, but can’t quickly connect with letters because of a processing speed, or a Rapid Automatic Naming (RAN) issue. Dr Michael Hart provides a more detailed explanation of RAN in this free webinar. Lynn Given’s Connect to Comprehension Course, also available through the Orton-Gillingham Online Academy, provides a wonderful resource for dealing with these issues. I recommend it to parents, tutors, or teachers trying to support a child who is experiencing reading comprehension difficulties as a result of decoding and/or RAN issues. For students with a SWRD profile, decoding skills need to be practiced by reading text out-loud. Lynn’s course includes plenty of this kind of practice. If you are wondering whether the Connect to Comprehension course would be right for you, you can watch this introductory webinar for free. To support SWRD or dyslexic students, while they work through the remediation process, and to help them to build vocabulary and comprehension, I highly recommend using audio books, such as those provided by organizations like Learning Ally. As SWRD students do not have an oral language comprehension impairment, they will benefit greatly from using this kind of technology. Part 2 and 3 of my blogs on the SVR will deal with the other two profiles on the reading difficulty diagram. 1. I’d like to thank The AIM Institute and Dr Louise Spear-Swerling for providing the Access to the Experts Community Speaker Series session, How Understanding Profiles of Reading Difficulty Can Help You Help Your Child. 3. 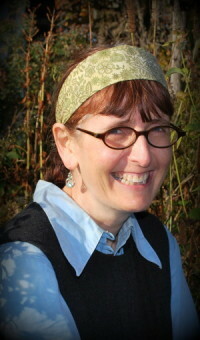 Maria S. Murray Ph.D. What is the Simple View of Reading? What it Means for Meaning-Making.